The Albania resurrection is very much about hope and light. God has shone a bright light on Albania. With God there is always hope. The summary of the mission team to Albania is love and change. I mentioned before that I left for a mission to serve, but I wholly and fully feel as though I was the one changed. The entire OCMC experience was spectacular. You haven’t lived until you have spoken through a translator! It is a wonderful feeling of interdependency and mutuality. I was a bit nervous upon planning and the eventual departing for the trip, but God’s strength moved me forward. The OCMC preparations were very thorough, financially fair, and complete. I always felt safe and well taken care of. Must we get out of our everyday way of seeing and living to see a greater dimension of God’s glory? Fresh eyes are indeed helpful to allow us to taste and see that God is good and achieve a fresh faith. I wonder, in a way, if this is what C.S. Lewis refers to about perspective when applied to reading. C.S. Lewis, in his famous introduction to On the Incarnation by St. Athanasius the Great, encourages readers to read at least one “old” book to every three “modern” books. Why would he believe this? Lewis states that where the “modern” books are true, they will give us truths with which we are already familiar. Where these books are false, they will "deepen the error in our thinking" when we are already dangerously “ill.” On the other hand, the “old” books prevent us from reading the “truths” that we half-know already, and in addition, reading the “old” books prevents us from deepening the errors of our modern times where the modern author, understandably, could have a perspective of our own current time. For me, this sheds light on secondhand news that we tend to hear from around the globe. It cannot compare to firsthand face-to-face meetings and befriending others of a different language made in the image and likeness of our God and Father. God knows that missions are good for our soul and spiritual eyes. That is why He gave us His final commission to go and make disciples with the reminder that He would be with us always. 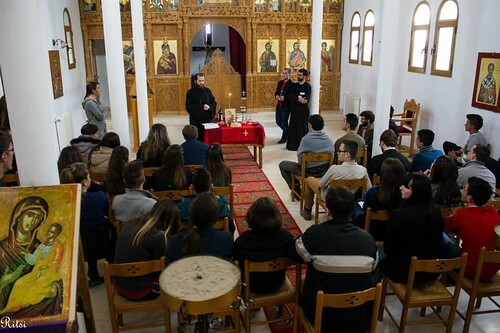 In our team’s final night we had the pleasure to sit down and meet Archbishop Anastasios. The summary of His Beatitude's blessing and exhortation was to simply be obedient. For me personally, this trip came at a time when I was in a career change situation and a bit of a sabbatical. I have been going through a period where I was perhaps forgetting about dreams and hope. The Albania resurrection is very much about hope and light. God has shone a bright light on Albania, and though darkness and corruption still remain in Albania, the people do indeed have a renewed hope. The light shines most bright in the darkness. With God there is always hope.